he Hoodliner's "Sound Soaker" foam absorbs engine noise, delivering a quieter listening environment in your vehicle. In addition, the Hoodliner reflects up to 97% of radiant heat to protect the hood's paint finish. 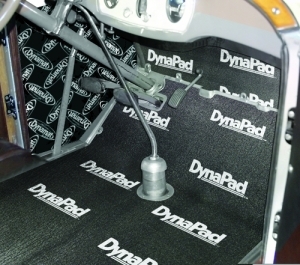 Dynaplate is a sound damping material specifically engineered for SPL competition rules and power classes of dB Drag racing, USACi, IASCA and IdBL. This same setup also reduces vibration better than any other product on the market.